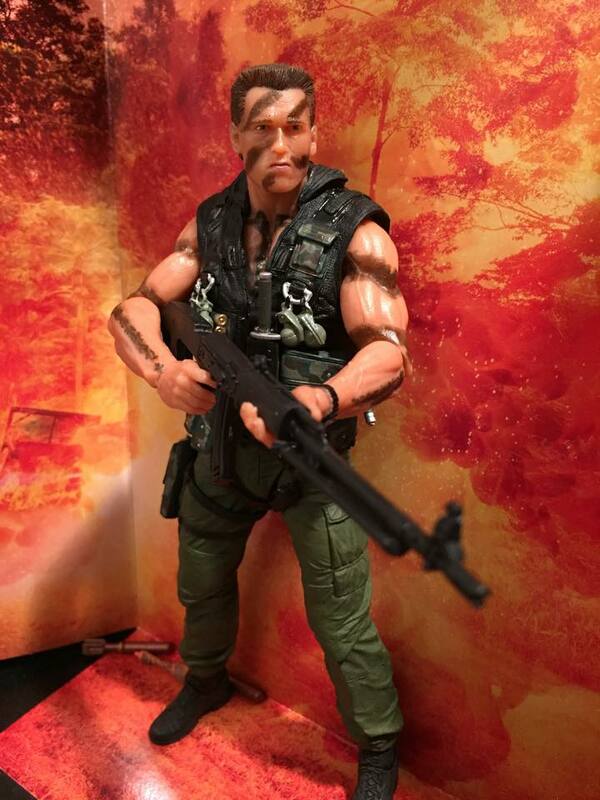 Anyone who has seen any Arnold Schwarzenegger movie knows that the man is all about one liners. As a testament to the guys fame, people know quotes from his movies they haven’t even seen. 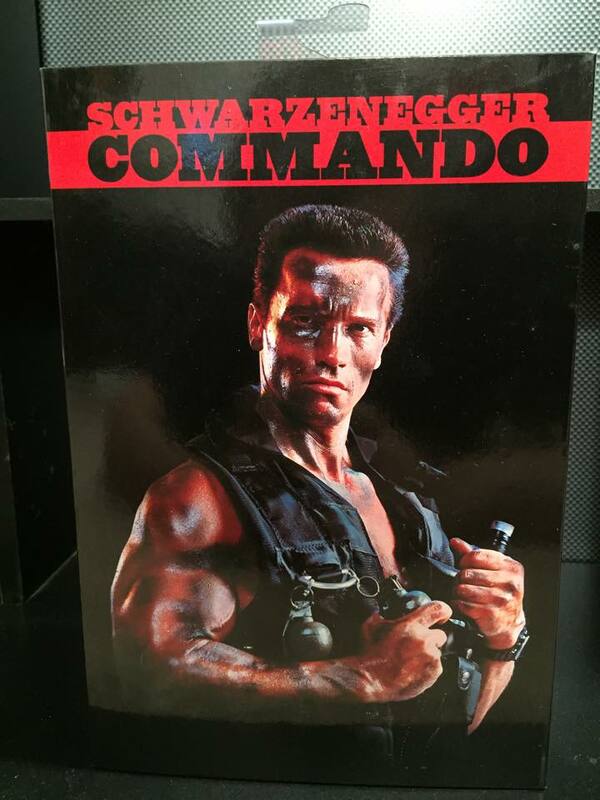 Well, Commando is arguably the most quotable as practically every scene Arnie is in has him toping the cheesiness of his last line. 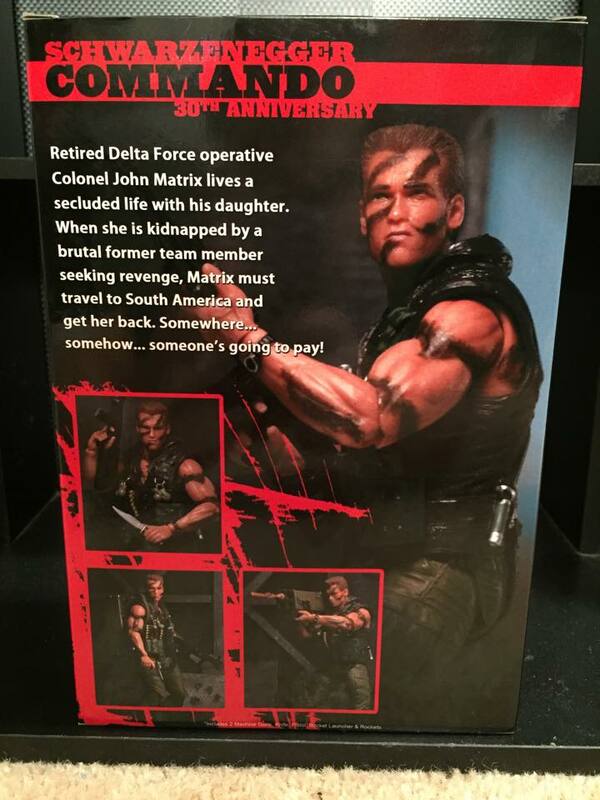 It’s really a perfect embodiment of everything that made 80’s action movies so great. It came out in 1985 and I probably saw it in 1989 or 90, And like every other little boy at the time, I loved it! 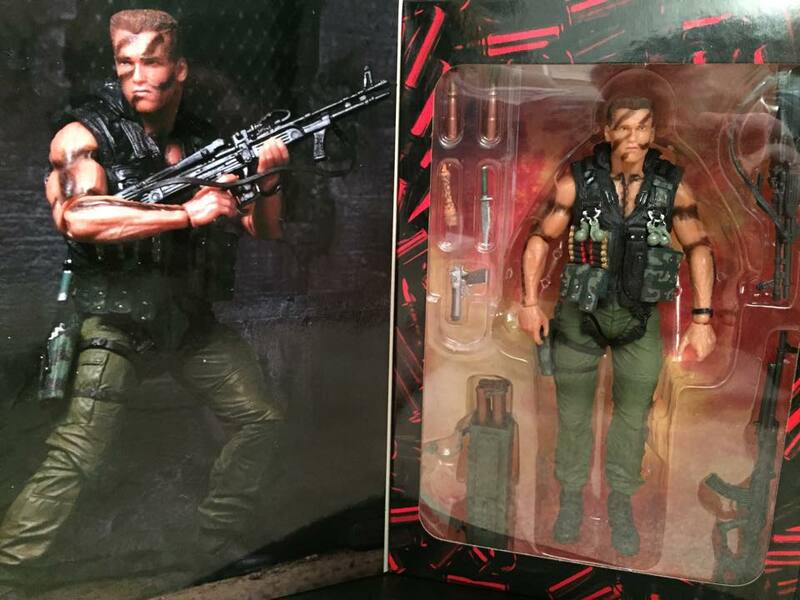 So, when NECA Toys announced that they were making a John Matrix, Arnold’s character in the film, figure, I freaked and immediately preordered one. 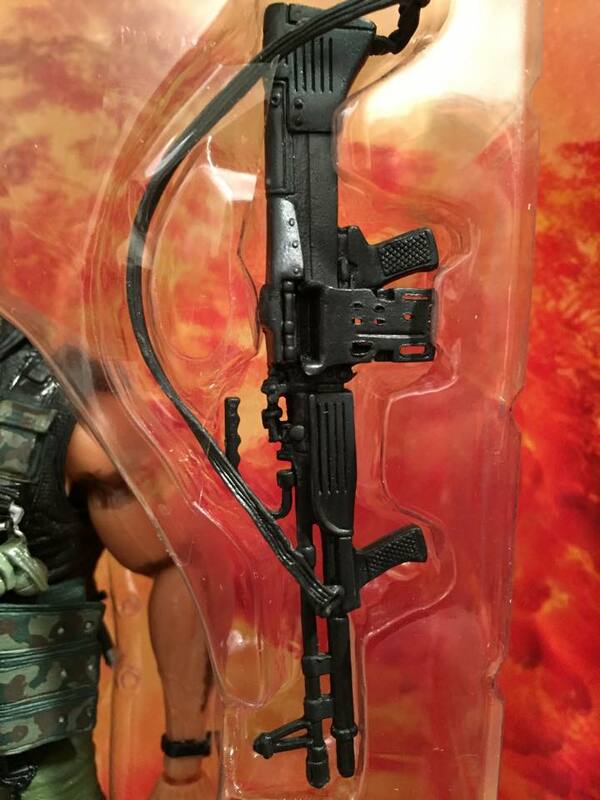 It comes in one of NECA’s awesome window display boxes. It’s held together by a tiny, circle of Velcro so these boxes are perfect for collectors who can’t decide between opening a figure and leaving it packaged. The back comes with a great gallery and plot synopsis of the film. 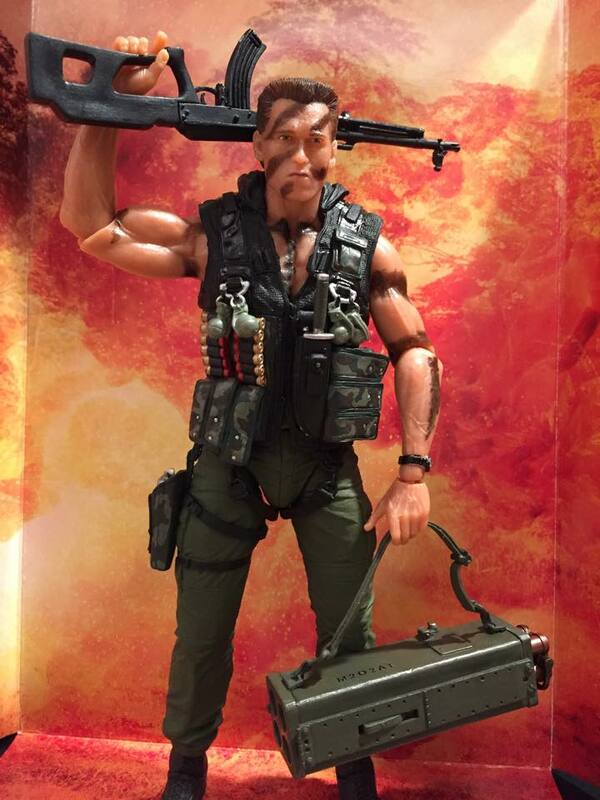 John Matrix is supposed to be a one man army and NECA really gave him the accessories for it, down to the figure being able to carry all these weapons at once. A pun about being fully loaded goes here! Two rockets, fire trail for rocket, combat knife that fits in vest and Desert Eagle handgun that fits in thigh holster. The M60E3. You know that gun you always see the good guy carrying with bullets wrapped around his other arm? This is it. And yes, that does happen in this movie. The M202A1 FLASH rocket launcher. 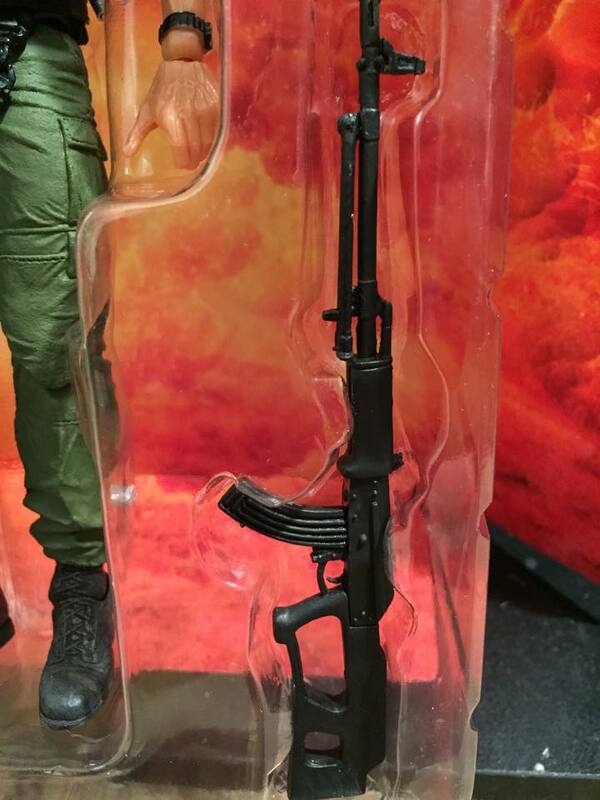 The firing tubes slide back and forth into the launcher body. The Valmet M78/83. This is the main weapon Matrix first takes into the beginning of the final battle. 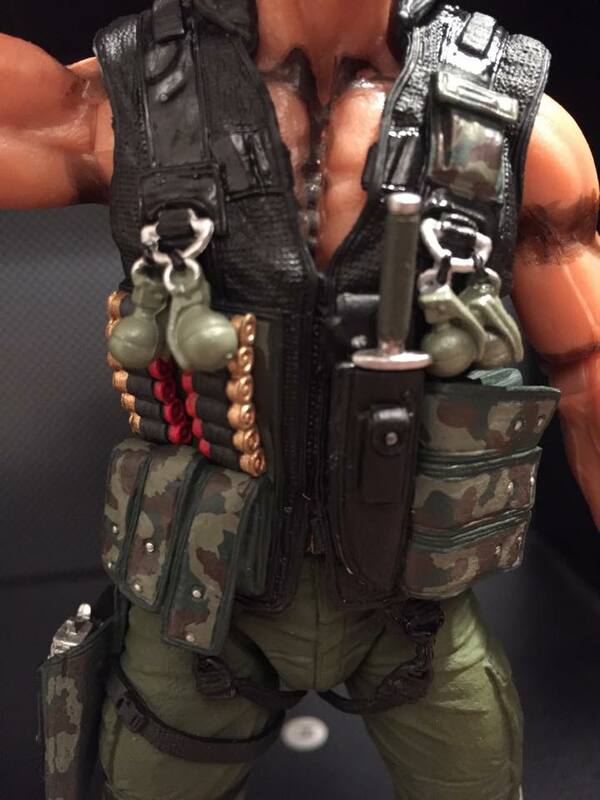 The vest is the centerpiece of the figure. The detail of the various pouches, straps and shotgun shells immediately grab your eye. The knife slides in and out of the sheathe. 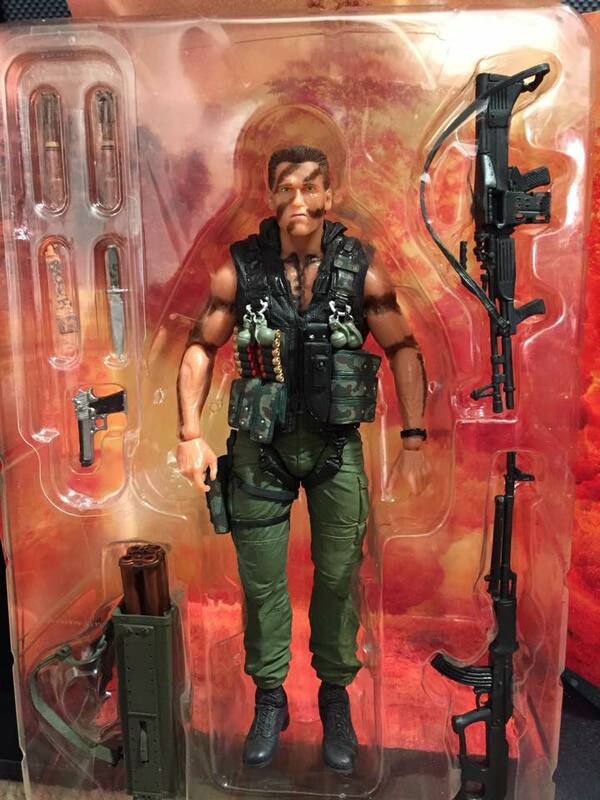 The “gear up” scene where Matrix loads this vest up is sheer, dumb grin awesome! 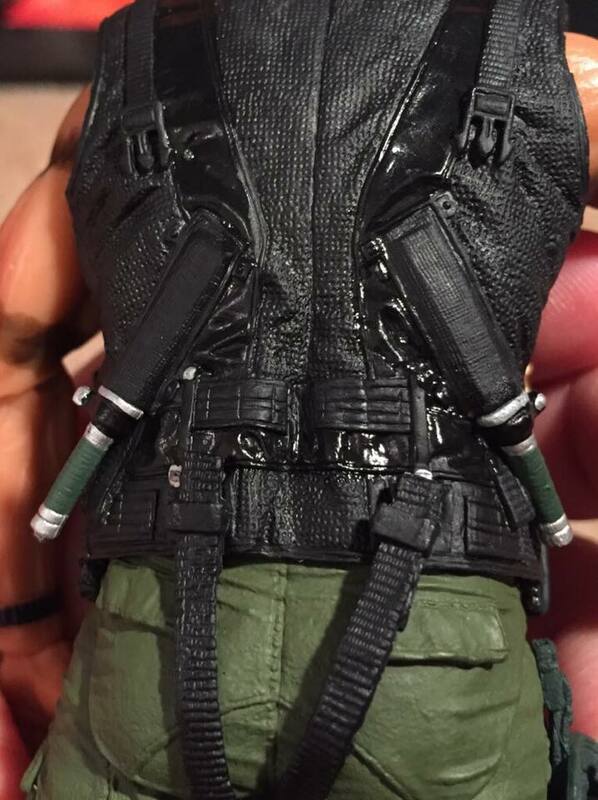 The back of the vest holds two throwing knives. Matrix actually uses these two knives in one throw in the film. The best part is that if you are a deep nerd like me you know that. If not, it’s just another awesome detail to the figure. 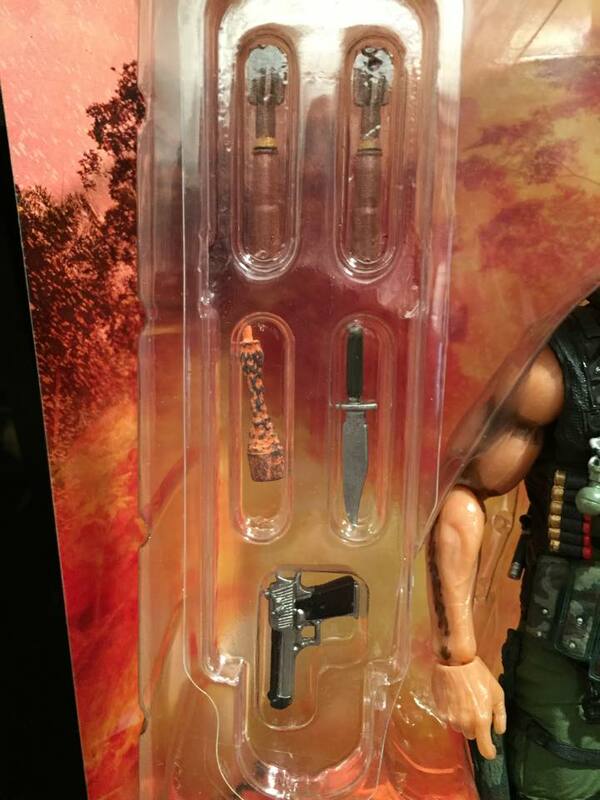 Unlike the combat knife, these are not removable. The knife kills in this film are ridiculous and you don’t care for a single moment. 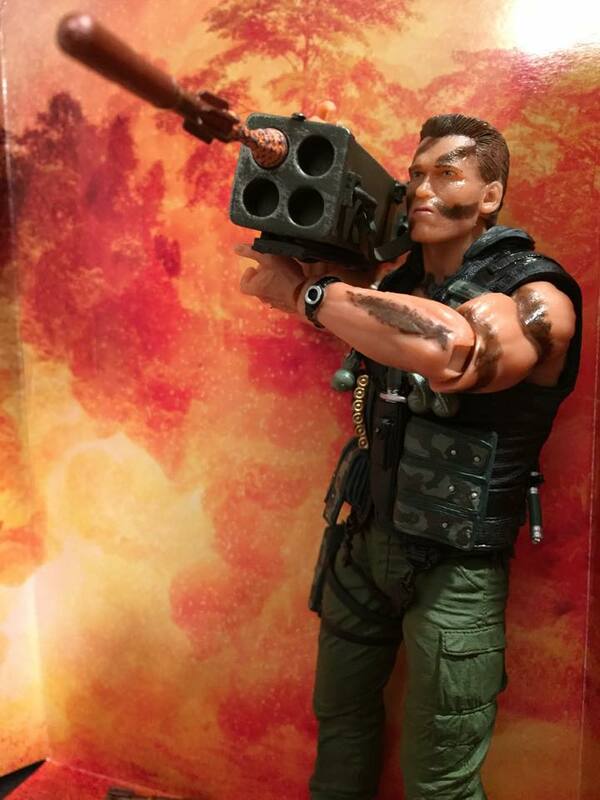 The jungle with massive fireball background insert makes posing the figure that extra bit of sweet as you constantly see Matrix surrounded by explosions in the film. Search “We Fight For Love” by The Power Station on YouTube. You’re welcome. All in all, it is an amazing figure. Great joint and articulation lead to dramatic poses and the huge number of accessories make it one of those toys you keep reposing because you love all it’s different looks. Throw in the window box, background insert and retailing for around $24.99, it’s a lot of bang for your buck! You had to get at least one pun. 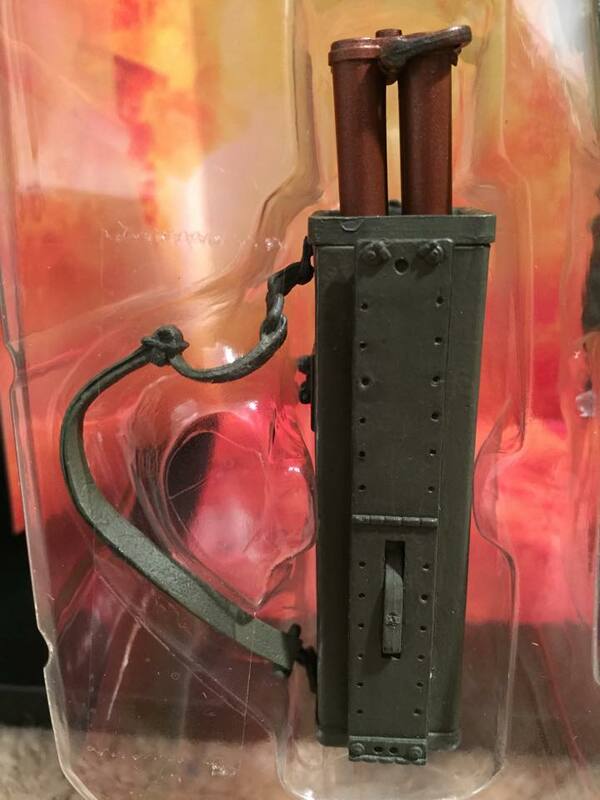 I’m hoping that we may see a second version of this figure one day without the vest to represent his battle damage from the end of the film.